One of the University of Michigan’s most famous teachers and one of Chicago’s most notorious murderers both loved the same bird ‑ Kirtland’s Warbler. And because of this love triangle, the Cranbrook Institute of Science in Bloomfield Hills, Michigan, possesses a unique exhibit which languished in storage for 39 years. Kirtland’s Warbler, the object of the affections of two such diverse men, is a perky, persistent, tail‑jerking bird, christened for Dr. Jared P. Kirtland, pioneer physician and naturalist of northern Ohio. The first specimen of Kirtland’s Warbler was shot on his farm near Cleveland on May 13, 1851. Dr. Kirtland observed and recorded that his namesake bird is blue, flecked with black above and pale lemon yellow below. He noted that the average, breeding adult Kirtland’s Warbler weighs less than half an ounce. Enter the first member of the triangle, Norman Asa Wood. In June 1903, an ornithologist from the University of Michigan’s Museum of Zoology went fishing in the Au Sable River in western Oscoda County in Michigan’s lower peninsula. While he was fishing, he heard an unfamiliar bird singing. He shot it and took it back to the Museum’s Curator of Birds, Norman A. Wood. Norman was a taxidermist and self‑taught biologist, and he retraced his colleague’s steps to find a Kirtland’s Warbler nest. For twenty years after Norman found the first Warbler nest, no one did much research on its breeding behavior. Then in the spring of 1922 an undergraduate student of Norman’s was intrigued by his accounts of the Warbler. This student was 17, extremely bright and academically precocious, and studying to be a lawyer. He was the son of a wealthy Chicago family, and an avid bird watcher and bird collector. The second member of the triangle and the precocious student was Nathan F. Leopold. Nathan loved birds more than people. As a young boy he had few close friends, but countless species of birds decorated his life. By the time he was a teenager, he had a collection of nearly 3,000 bird specimens in the third floor study of his home. Frequently he toured the woods and marshes around the Chicago area, looking for new specimens to add to his collection. On his own initiative he got permission from the City of Chicago to shoot birds in the public parks and kept several guns for this purpose. Besides spotting the Warbler, another highlight of Nathan’s trip was meeting James MacGillivray of the Michigan Conservation Commission. MacGillivray took motion pictures of Nathan feeding his Warblers. 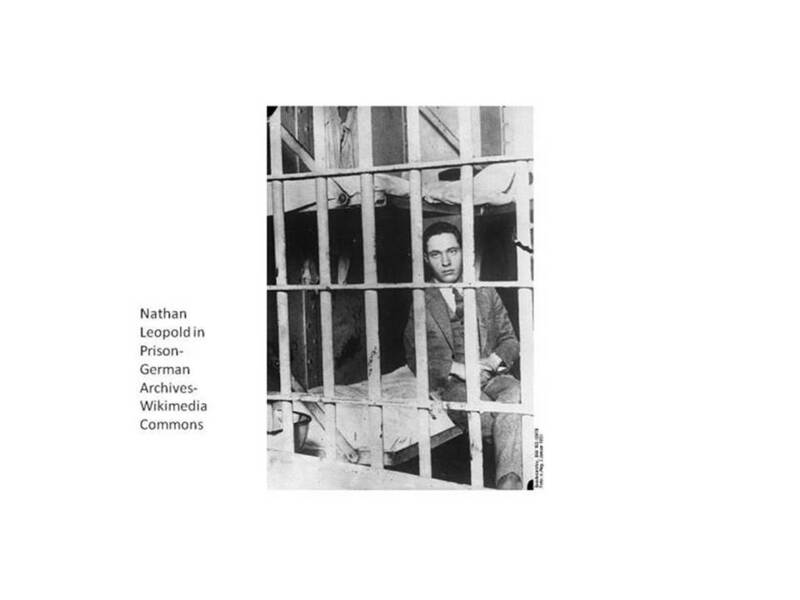 In October of 1923, Nathan went to Boston to deliver a paper, “The Kirtland’s Warbler in Its Summer Home,” at the annual meeting of the American Ornithological Union. He submitted a report of his expedition to the Ornithologists Union Journal, which it published in its January 1924 issue. One thing that Nathan didn’t mention in his report was that he had shot two adult Kirtland’s Warblers at one nest and had taken their three nestlings and a baby cowbird and the nest itself. He also took a three foot square chunk of the surrounding habitat and a jack pine. Nathan didn’t dare mention this to anyone because he didn’t have a license to collect Kirtland’s Warblers which were highly protected. But legally or not, Nathan shipped the specimens by train to Chicago and a taxidermist at the Field Museum of Natural History created a life‑like display. On Sunday May 19, 1924, Nathan and another friend, George Porter Lewis, who shared his interest in birding visited a number of bird habitats in and around Chicago. They ended their bird watching day on the city’s southeast side, near Wolf Lake, a mile inland from Lake Michigan astride the Illinois and Indiana border. While the taxidermist at the Field Museum was fashioning his display and George was recovering from his day long birding bout that Sunday, Nathan and his wealthy friend Richard Loeb were committing a murder. Four months after Nathan’s Auk Report was published, on May 21, 1924, Nathan Leopold and his wealthy friend Richard Loeb lured fourteen ‑year‑old Bobby Franks into a car, killed him, and left his body in a ditch near Wolf Lake where Nathan and George had bird watched that Sunday. The exhibit was returned to the Museum, but was never displayed. Instead, it remained in storage for 39 years, pristine in its original wrappings. In the meantime, Nathan continued his involvement with birds. Over thirty‑three years in prison, he raised cages of canaries in his cell and read about and studied birds. Nathan Leopold also told Douglas how anxious he was to re‑visit Kirtland’s Warbler country. Finally, in 1964, Nathan and Douglas took a trip there. “That trip, getting to know you, meeting the other Kirtland’s Warbler enthusiasts, and of course, renewing acquaintance with The Bird, constituted a glorious experience,” Nathan wrote to his new friend. Douglas Middleton won so much of Nathan’s trust and affection that Nathan told him about his habitat group, still stored at the Chicago Field Museum. Nathan said he still owned the display and wished now to give it to a museum in Michigan, although not to the University of Michigan, because it had the other habitat group of the Warbler collected by Norman Wood in 1903. Douglas suggested the Cranbrook Institute of Science and Nathan agreed. The display was sent there in 1965 and the flora was refurbished and displayed in the Ecology Hall as part of an exhibit that was called “One Does Not Live Alone.” Nathan Leopold’s name didn’t appear on the exhibit. He remained a loner until he died on August 29, 1971. Baatz, Simon. For the Thrill of It: Leopold, Loeb, and the Murder That shocked Chicago. Harper, 2008. Higdon, Hal. Leopold and Loeb: The Crime of the Century. University of Illinois Press, 1999. Leopold, Nathan F. Life Plus Ninety-nine Years, 1974.